Composition Notebook found at Walmart for 25 cents. peel back the black binding paper. Keep it on the spine, just peel it back. Cut your paper (2 pieces) to fit the composition book - mine was 9.75 by 7 something (sorry) I sprayed glue on the front of the book and on the exposed black binder tape/paper thingy. I rounded the 2 corners on the paper and lined it up then pressed it with my cricut scrapper. Letters and mushroom were from Cindy Loo. I took two different strips of paisley ribbon and made the bookmark and the closing thing with velcro - picture two will show you those. Also, I put the same paper on the back repeating the steps above. RULES RULES RULES - Your message will NOT be counted if it is posted before the official start time of the blog hop and you have to start at www.pinkcricut.com then follow the links provided. Cute idea. My granddaughters will love this one! Wow! What a cute altered composition book! I've already stocked up on these at great BTS prices - can't wait to make a few. Thanks for sharing! Adorable! I love that mushroom! Doing this one for my college girl. Thanks for sharing----so cute and hope you feel better. Adorable! Now is the time for this project when the notebooks are so cheap! Very creative:) Such a neat idea! I just love the personalized comp books, very cute. What a fast and fun project! Thanks so much for sharing! Love your blog and blog design and have just become a follower! SO SUPER Cute!!! LOving these composition notebooks! Thanks for the chance to win! Great hop so far. This is a great idea for my kids. Super cute!!!! I love altered comp books. This motivates me to get busy and make a few for back to school :) Thanks for the chance at your give away too - very cool!!! I'm loving this HOP thanks for participating. I never thought about peeling back the black strip. I will try that next time I do composition books. Thanks for sharing!!! Thanks for sharing this great notebook. 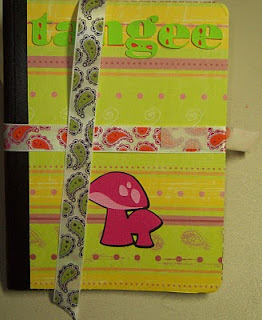 After this blog hop I am going to have to go in my craftroom and do this to my daughter's composition books. I love this project and I know she will like it too. Now if I just had Cindy Loo then that would make it GREAT!!! These are fun to make. Thanks for sharing. And here I was thinking I was all done with that section of Walmart, Back I go stock up on these! That ribbon is so great, My 11yr old and I are suckers for paisley! Very cute!! I have made a TON of these books over the years, but NEVER EVER thought to put velcro on it.....great idea!! Thanks for sharing and thank you for being generous with your give-a-ways!! I love the way you decorated the book.. So cute. I am so glad I found your blog. I hope you feel better and great news on your husband getting a job. Thanks for the inspiration and a chance to win. Thank you for sharing! I am already a follower and love your blog!! Amazing the ideas you girls come up with. thanks. My granddaughter starts Kindergarten this yr. Can't wait. This is such a great idea. My daughter is always having her things stolen at school. This is a great way to make her stuff personal. And keeps others from stealing her things. Thanks so much for sharing. Cute comp book! I will have to make some for my duaghter! :) Thanks for being on the hop with us Tangee!! I need to head on over to Wal-Mart and pick several of these comp books up. They will make great Christmas gifts. Very cute! I have never visited your blog before, but I definitely will again because I LOVE it! Thanks for sharing! Congratulations on hubby getting the job! Yea! I love the comp books...so versatile! Thank you for sharing your awesome ideas! Cute project ... Cindy Loo is just the best! Tangee this takes 'doddling' on your school notebooks for decoration to new heights! Thanks for the idea. Very cute! I love the addition of the bookmark for the notebook! This is a great idea. Love the "bookmark" part... makes it so easy to find your page. Thanks for sharing. Thanks for sharing! Great idea, and thanks for the chances to win!! What a great idea , you are very crafty :) I am now a follower of yours , thanks for sharing . wow i never thought of decorating a composition book before! i had sooo many of these black and white books growing up. it's so easy too! thanks for the chance to win! Thanks for sharing your notebook. So cute! Thanks for sharing and for the chance to win your giveaways! Too cute. If I should win, could I have my daughter's name put on the book instead? Take care. Very cute! Thanks for the chance to win and have a great day! What a sweet idea - inspiring! Thanks for a great blog hop - I love hopping. And, thanks for a chance to win some awesome blog candy! I've been eyeing Cindy Loo! Love this love this love this! I think i might have to scraplift this idear from you! Super cute! Thanks for sharing. What a great way to personalize a journal or school notebook! And what a GREAT deal on the initial notebook purchase - hahahaha! Congrats to your hubby on the new job! What a great project. Love the idea. Thanks for the ideas and instructions...cute project! I hope to get lucky with the prizes. This is a great project that I can share with not only my own daughter, but also my Sunday School class. Thank you. Too cute - am going to make some of these this weekend, I think. Great idea-and just in time to catch the back to school sales for the composition books! Thanks! what a great idea, now I know what to do with all my comp books i have collected over the years. Wonderful cheap ideal for back to school. Thanks for the cool project and the chance to win the cricut cartridge! So cute! Kids would love to bring that to school and show it off! Too sweet! I've never seen it with the bookmark- What a great idea! Thanks for sharing! Cute, Cute, Cute! Who doesn't always need a notebook! I have them all over the house and one in my purse! LOL Already a follower and would LOVE to win Cindy Lou, I've been wanting this cart but put myself on a budget since the Hubs hours got cut in half. But hopefully the home renos will get done faster now, LOL TFS! Thanks for a great idea!!! i can't wait to make some of these notebooks!!! Oh how super cute this is!!! Thanks for the awesome idea and the chance to win. I love this idea for the older students!! You sure can make this project your own!! LOVE the bookmark too... great idea! What a great way to personalize a notebook. Any crafty girl would love one of these! I think that all students would love to have this even parents just to use as a journal. Love this idea! Thanks for the chance! What a great idea!! Thanks so much for sharing!! Tangee...how cool. I like the idea of the closure ribbon. Awesome idea. Very sweet project. your project came out supercute! TFS! Such a cute project! Thanks for the chance to win the cart! 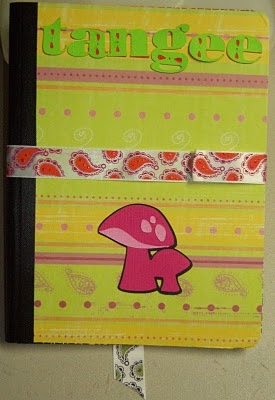 What a cute and fiarly easy and inexpensive way to liven up a notebook. Thanks for the chance to win. love your work..thank you so much for the chance to win. Great idea for the book! TFS!!! Cute, cute, cute composition book. Congrats for DH and sorry about your back. OK, OK, after hopping around, I'm determined to make a cute altered notebook too!! Yours is great...love the bookmark! I really like this cute project. It's ideal for students and for anyone really. Thanks for the chance to win! I'm going to try this! I have an eighth grader who is a gamer. SO gunna try to do this with a video game twist for him! TFS! Love the notebook. Would love it w/ my name on it. great idea. Wish I had kids going to school. Cute notebook. Thanks for the tip on pulling back the black binding, I did not think of that. Thanks for sharing. Tangee.... great job! Like your design! Great project..hope I win and I won't have to make my own :-) You've got a great blog here as well, Thanks to the Blog Hop I found you. Thanks for the opportunity to win your blog candy. Very cute Tangee! I am definately going to make a few of these... Now I just need the Cindy Loo cartridge!! Hint Hint LOL TFS. I'm off to see Momo!! This is cute and then some! Great job! Sorry about your back. Take it easy and Congrats on Hubby job! Such a cute idea!! I love how the bookmark is glued in the back. Thanks for sharing!! 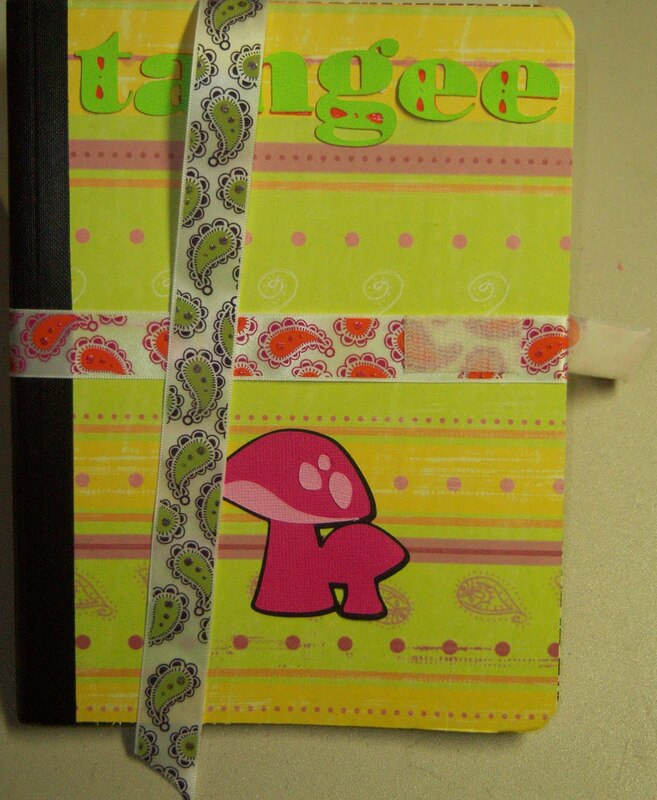 What a cute altered notebook. Love the bookmark idea too. TFS and for this wonderful opportunity to win. This is something I have made, and gotten great reviews on..........thank you for sharing and joining in on this blog hop, allowing us to win some awesome prizes. Love working with the composition books. I made a bunch for all the different meetings I do. Yours are so cute! Love your altered notebook, these would be quick and fun to make! LOVE your blog candy, count me in! You are so talented. Thanks for sharing your cute altered notebook idea! such a great way to make a notbook unique! great gift idea too! Such a cute and inexpensive project. Definitely going to try this one!!! Great job, Tangee! I just finished doing a composition book for a birthday gift. (It's posted on my blog.) What a great give away. Thanks for the chance to win!! One of my favorite things to do with composition notebooks!! Good job. This will make a great gift for back to school!!! It is a beautiful composition book! Thank you! Oh, if I win, I don't want *MY* name on it!! LOL! J/K! Great Idea! I will have to make a few for my kids!!TFS! Great project for older students to do in school if used as journals. Thanks. Super Cute. I love the Cindy Loo Cartridge, but it is one I haven't gotten yet. These notebooks are so fun, but you gave me some new ideas on how to do them (I never lifted the tape before). Laura (oh, and I am a new follower, too both on blogger & Facebook). Great notebooks!! And love the candy ;) TFS! What a fun idea....thanks for the chance.. Thanks for sharing such a fun and simple idea. Wow, I am so glad I participated in this blog hop because I am finding some awesome blogs! I don't know how I missed them before! Thanks for the chance to win! WOW!!! what a great way to change a boring notebook to something they will be proud of. Thanks. Love your blog; Keep up the great work. what a cute notebook, thanks for all the fun today. I got distracted from my computer, and thought I left a post. But don't see it here. I am not meaning to double post! I really like this project. These are so great to have on hand to use at work, as I am a teacher and it is great to note observations and things about students and such in the classroom! Adore the mushroom! I am really lovin them at the moment as an embellishment! I love altered notebooks, they are one of my favorite things to do. My kids love to take them to camp for addresses and email addresses of kids they became friends with over the summer. This is a great idea and very simple to do. Makes going back to school fun! Cindy LOO!!! I would love this!! Having a blst on this hop, started a little late but I hope I can still win something! Great project!!! Cute idea. It is a neat and quick idea. Thanks for sharing and the opportunity to win. Quick and fun. Really like the velcro closure for the notebook. Thanks for the chance to win some awesome blog candy too! This is great project and love the colors you used well bye for now & have a great weekend. Having problems with the order to go in blog jump. Been to all before you and still shows haven't been to Momma K's. When try and go back your link doesn't work. Go back anyway then come here still shows haven't been, but I have. Thanks for the great project and giveaway. Your husbands fear quote really made me laugh...thanks so much!! How cute! As usual! You always make cute things!! TFS and inspiring, as always! I've been a follower for a while. love your blog! and can't wait to see what yo come up with next! I love these simple yet personalized projects. Great idea. Hi! Thanks for the chance to win! I love the personalized good! i'm always writing in journals and stuff. this is a great idea to personalize one and makes a great gift. thanx for sharing. What a cute idea - I am going to have to make some of these for gifts. Thanks for sharing! Great comp book! I haven't tried the spray glue yet, but may give it a try now! I also signed up to be a follower, so now I'm off to check out the rest of your blog! what a great idea and super cute, thanks for sharing. What a great idea! i also wanted to let you know that you blog background just makes me smile!!! it is so bright and cheerful!!! What a cute notebook - I'm definitely going to have to try it! Yor notebook came out very cute. Very cute notebook. It would make a great teacher gift. I love making these. Yours turned out very nice. Ok, off I go the next hop. What a great idea. Thanks for sharig. WOW! What a cool project - being a 1st grade teacher I love the idea of a Back to School blog hop! :) Thanks for the chance to win. Very cute project and even though I don't have kiddos in school anymore, I could make some of these nifty books for grandkids, myself and my friends. They would make nice little inexpensive gifts. Thanks for the inspiration! I will have to give this a try! Thanks for the super idea. These would make great little journals for any occasion. What a great project!! I think even I can do it. Thanks for sharing the directions. I am a follower and started at Pink Cricut. What a great way for me to personalize notebooks for my students... LOVE IT!!! Love changing the covers to a notebook to make it your own. Thanks for sharing. These are really cute. I teach math and I have already purchased enough for my students to use as a scrapbook/notebook for the year. Would you mind if I used the picture from yours as an example of how they can personalize the cover?